Matt has reached his six-month mark here at Fox Plumbing & Heating. He’s been doing very well, and has been added to the water line installation team under the tutelage of José. I sat down with him last week to see how he was getting on, and what he was focusing on for the next six-months. Q: First, congratulations on celebrating six-months at Fox Plumbing & Heating. How are you feeling now that you’ve been with the crew for half-a-year? A: I feel great. I’ve been working hard and learning a lot about plumbing and water line services. I’ve become really self-reliant in water services, and José is now trusting me to run some of these jobs with very little direction. And I’ve been attending the morning meetings with Mike B. and he’s been teaching us about sizing for gas piping. Q: How are you getting on with the team here at Fox Plumbing & Heating? A: Great. I know the guys pretty well, and I don’t hesitate when I have to ask for help. They’re really helpful and great to learn from. Doug has given me a number of books to read and review to help me learn about plumbing. And he’s even letting me come to our technology iPad training to get me up-to-date with the new technology we’re using in the field. During the training with Mike B., I had a lot of questions to start, but JP really helped me out. He sat with me to help me understand sizes and certain terms from the training. By the end of the classes, I was really getting a strong understanding of what was expected to make the right calls for gas re-piping and sizing. Q: What’s one thing that you’ve learned about yourself over the past six-months? A: I’m learning that I really enjoy working with my hands and being outside with the Fox team. I’m gaining a depth of knowledge about plumbing that I don’t think that I’d have without Fox Plumbing & Heating. The team has a great understanding of mechanical knowledge, and I’m really feeling like I’m learning what I need to for my Journeyman’s license. Q: What do you think the next six-months have in store for you? A: I’m really excited to be on the water line team, and I’m looking to getting more experience with water services, but I’m also interested in learning more about sewer service as well. I think both José and Wyll are great teachers, and I’m really looking forward to learning more from their experience. I want to be able to be able to diagnose and identify small problems before they turn into big ones for our neighbors, friends and customers. Q: Sounds great. Looks like you have a lot of work still ahead of you. Anything else you want to share with our readers? A: "Ha ha, yeah I do still have a lot to learn, but I’m eager and everyone is really helpful. I’d say that the brotherhood that exists among the plumbing professionals at Fox Plumbing & Heating is the most important thing that I’ve seen in my six-months here. We’re more than just a bunch of plumbers doing jobs in Seattle or King County, we’re a community. We stand up for each other and will do anything we can to protect our reputation as the best plumbing, heating and air conditioning service company in Seattle and King County. If that means working late or coming in early then we are there for each other. We’re like a team, like the Seahawks, and we’re always watching out for each other." 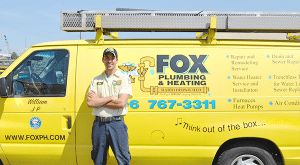 We at Fox Plumbing & Heating always work hard to ensure the best possible service for our friends, neighbors and family.